My desk is looking better but still has lots of projects to complete; four down four to go and that is the computer work. Stitching projects are still holding at four, well maybe five in the nest…millions in the wings (I’m going to live forever if my needlework round-toit projects are any indication.) I think I will refrain from signing up for another class for awhile but I won’t make any promises. Many of you are heading for San Antonio and the national ANG seminar (http://www.needlepoint.org/Seminar-11/index.php) … have a great time and keep us posted about all the good times. I’ve always thought they should call it the “Great American Stitch-in.” When I did attend, there was always a place where everyone could gather and stitch into the wee hours of the morning. I learned lots of new ideas, new techniques, found new threads and met many great friends here…I do hope they still have this area…that’s what we are all really about…stitching, learning and sharing. So all you wonderful stitchers have a great time, stay cool and keep us posted on what’s happening. Here are my first two Christmas presents completed; now if I can just remember where I stash them and to whom I plan to give them. There was one small hitch with the finishing but the framer made it worth the mi$take ; one was suppose to have a blue mat, but two pictures framed for under $100 is very rare (one would be rare), so I’m not complaining. Here’s the progress on my class, Laura Perin’s, One Long Panel (http://laurajperindesigns.tripod.com/index.htm). I am keeping up with the class and this week I have two weeks to complete the area (our instructor is headed forSan Antonio). I try to make every class or even just a project I do learning experience. 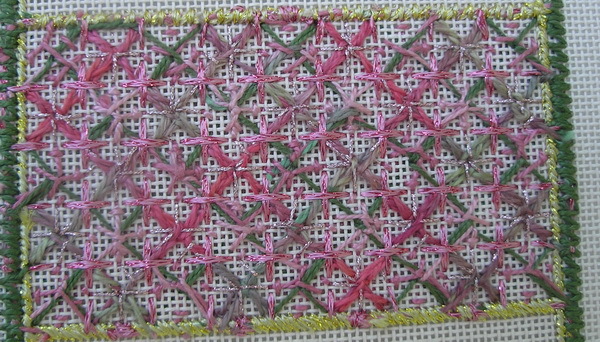 First I started stitching the border, I always pay attention to the where and how I going to anchor my threads, so I sometimes change the stitch order, especially if it does not affect the appearance of the stitch. 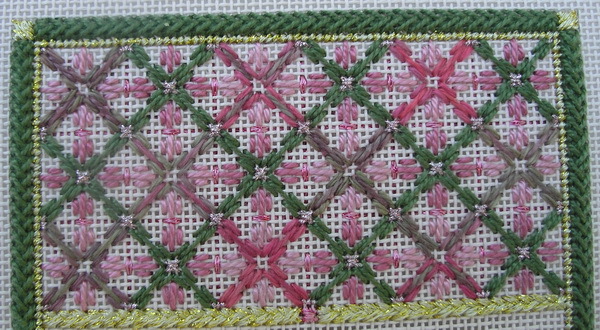 I did this for the Overlapping Cross stitches in the border. Our instructor for the class suggested we stitch the sides of the border as we go because there has been a discrepancy in the count (more about that later) so I just stitch far enough to complete the next session but I do make sure I have places to hid travel threads and bury threads starts and stops. And I am also watching the placement of these stitches. Before stitching areas of the piece, I am really thinking about the order/ direction I am placing the stitches. I am not only watching where the colors may be placed but I am watching how I place the stitches. 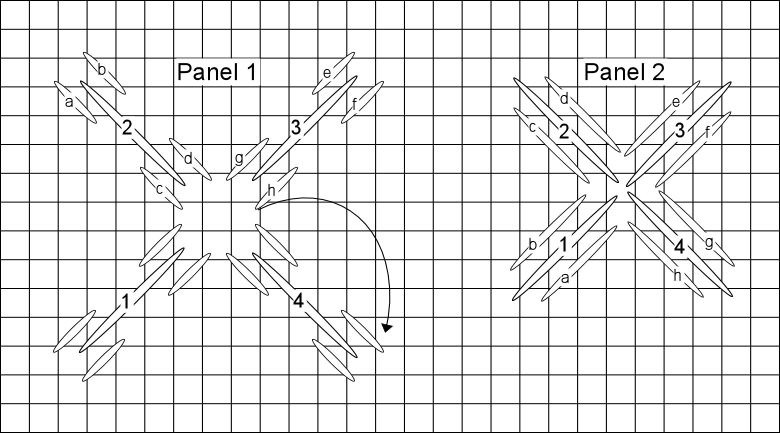 I noticed when doing the first panel I could see the travel threads being carried from one stitch area to the next, but if I thought about the placement these travel threads were not so visible. So I made a decision to take the time to plan my stitch order while I was still trying to place the color in a pleasing placement. You can see when I hold the canvas up to the light the open areas and when you look at the front close up you can see it too. It may have been unnecessary but it was an interesting study and I will know. 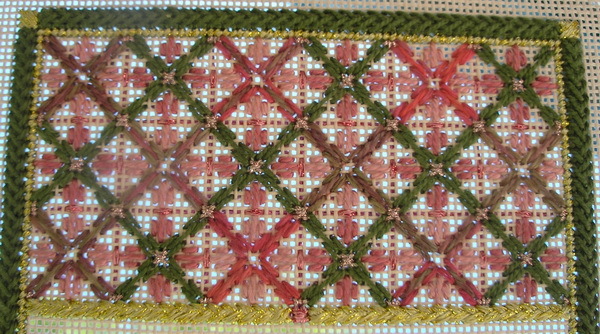 On panel three (LP Area 6) I stitched both sides of the area (Herringbone) at the same time so the overdye was symmetrical, others in the class stitched up one side and down the other (I’ll try and take a picture of this and show next time.) 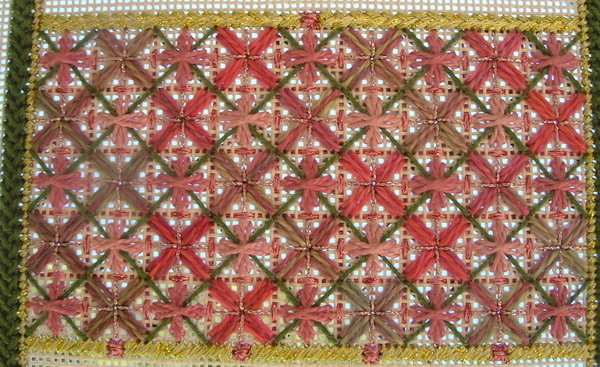 I also tried not the have the overdye cross the open areas where the Rhodes Stars were to be placed. And when I stitched these Rhodes Stars I buried my travel threads. The rest will have to wait for another day, must get back to the computer. Those of you heading for San Antonio have a stitching good time and if you have a blog don’t forget to write! Well, maybe one more…Will take them to the framer in the next couple weeks and show you when I get them back. Well, it is still very very warm but the weatherman has promised relief the next two days…I think these weather people should take up needlepoint, maybe they would get better results. 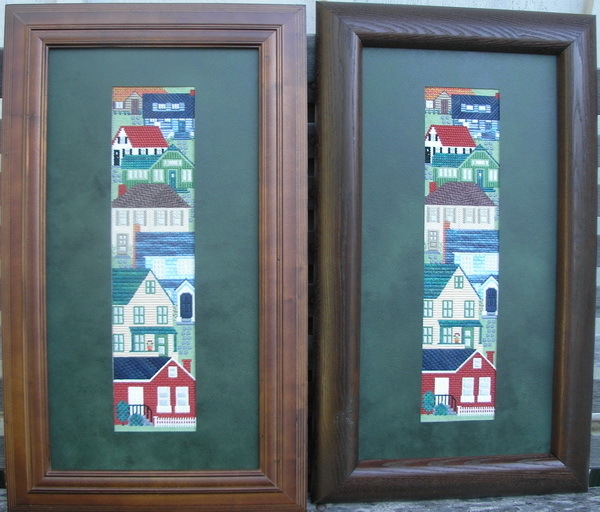 Hey notice by the windows I stitched this piece twice…68+ places to use Marlitt…such fun. But as luck would I ran out of Marlitt and did not have a back up skein. 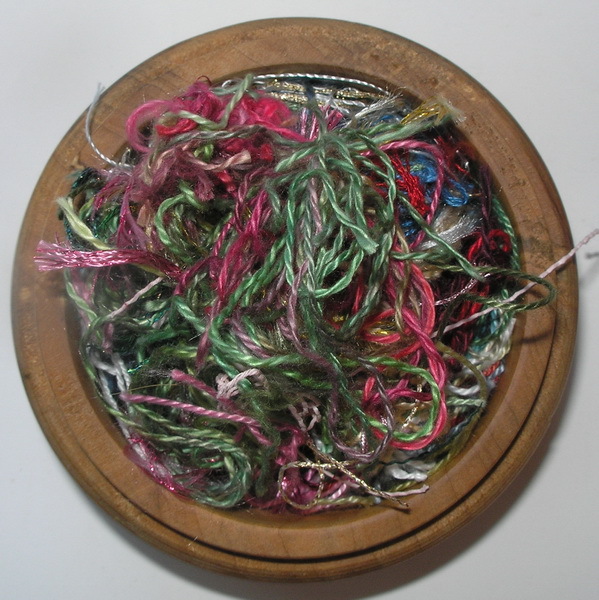 I did have DMC Satin Floss; looks like Marlit, same color, 6 ply instead of 4 ply…I’ll try it. Now call me crazy, but I dampened it used 4 ply instead of the 3 Marlit and I really thought it laid nicer, I didn’t think I had to fight it as much and I can’t tell the difference. Notice I did not say, I’m in love with this thread but I did think DMC Satin Floss handled better than Marlitt. And yes, I stitched this twice. My DH loves everything I stitch, but seldom says more than this is nice, but he did say this piece would look great on our family room wall. Humm-m-m justifying finishing…a gift for DH! 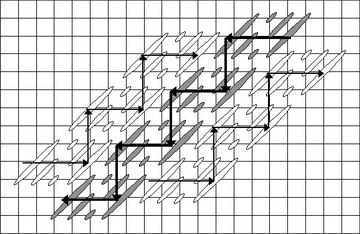 ;-) And I like this piece too… it truly is a sampler of architectural stitches. If you want a fun piece to stitch, this would be one. Oh yes, remember the last time I blogged about “The Neighborhood” (https://sudukc.wordpress.com/2011/07/15/more-to-the-neighborhood/ ), I was going to compare pictures from my old standby camera to that of my Droid phone. The Olympus are on the left, the Droid pictures on the right; I thought the quality was pretty much the same. My phone pictures were large files for whatever reason because size-wise they were the same. I liked the brown roof of one better and the red roof of the other. I have noticed I do better with non antimated subject matter on my Droid…people seem to blur quicker. Maybe I just need to learn my phone/camera better (I’ll put this on my tuit list.) But now I can take look for new camera off my tuit list until the next time I get a bee in my bonnet. My old friend will work for me and I know just how she works, so for now my trusty Olympus Camedia C-5500 with its 5.1 megapixels is safe. I’d like to stay and gab but I barely am going to get this blog posted. I have two other projects for other people on my desk and I am suppose to be writing a project for my guild…gotta go…work this week-end. Remember last time, “this roof was a challenge.”…the brown roof? In the close up picture you can see it very well. I think that stitch was the challenge of the piece. It might be a toss up between the brown roof and the green roof, both were different but effective. I forgot to include it in the last post but here it is…Susan Jones called it a Byzantine but I thought it was a small Milanese. 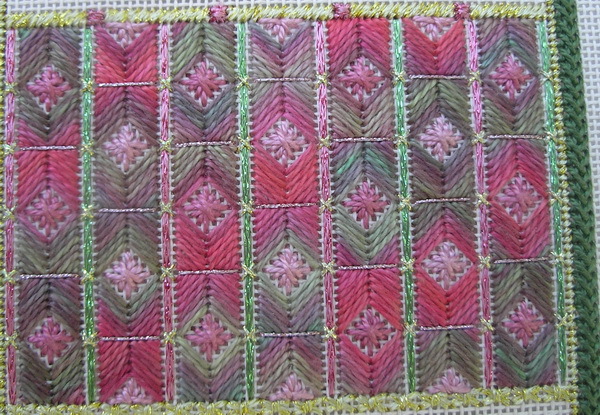 What’s interesting about this stitch is that depending on how you chose to stitch it the effect with an overdye will be quite different. I chose the method on the left. I was reading Consumer Reports Magazine (August issue) this week, an article about phone cameras. I think next time I take pictures of this canvas I am going to us my phone Verizon Droid X and my trusty Olympus Camedia C-5500 with its 5.1 megapixels to see the differences. I have looked at purchasing a new camera but I haven’t been able to justify the expense in my mind when this one works and I like it. But we will compare pictures next time to see if I see any differences. We are having a Heat Warning or Advisory this week-end. I really hope it lets up, I do worry about the elderly and those without air conditioning. No matter what the weatherman calls it, the weather is just plain HOT! So I guess I will be forced to sit in my air-conditioned house and stitch…Oh no, such a burden! The Neighborhood is growing. Two more houses have been completed. 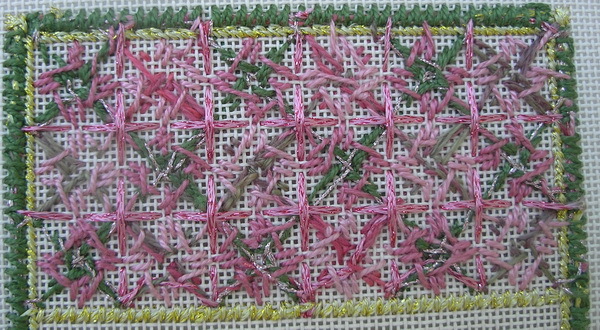 I really am enjoying this piece, it is a sampler of stitches for architecture. See the top house…this roof was a challenge. I liked it but it was a stitch to take care with and then of course it changed direction at the hip of the house. 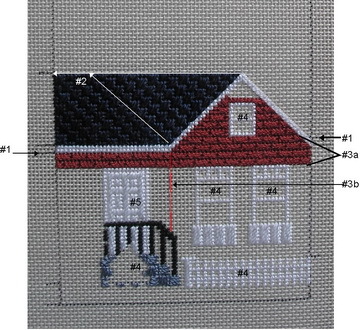 The siding of this house was a 4 way continental but for me was a challenge as I normally stitch on the diagonal and this was stitched row by row so the thread on the back side would not show when viewed from the front. See the difference in the diagrams? I would catch myself trying to revert to “my way” but with the exception of maybe one or two miss-steps I think I did pretty well. My photo is a bit off, but then I’m a bit off this week too. Holidays always throw me off…I never know what day of the week it is until we have a full 5 day work week. I’m better with Monday holidays than Friday holidays too, so next week I’ll be back on track. 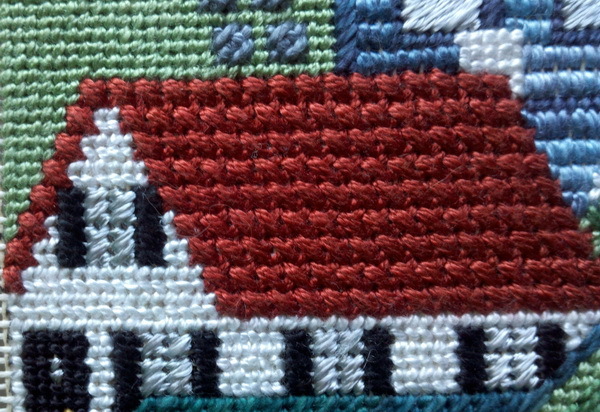 I want to share my new architectural needlepoint skills, “The Neighborhood” is proving to be quite a lesson in learning. I love the way Susan Jones has subtly marked the corners of the house (A in photo) by starting and stopping the stitches rather than outlining the corner or changing thread color. 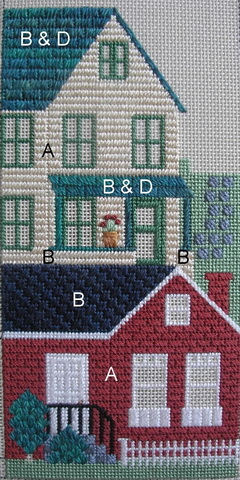 She also has offset stitches to give dimension (B in photo), and uses overdyes (C in photo) to suggest shading. And the roof stitch of house two (D in photo), while easy to stitch, takes a moment to watch the count; a great shingle stitch. I love this piece and when I first started stitching this piece had no one in mind, just liked the piece. Now that I am stitching it, I have several people I think would like this as a gift. And that brings up a question: “How many times can you stitch a piece from the instructions you purchase without being in copyright infringement?” Read U.S.Copyright Law: http://www.copyright.gov/title17/ especially Section 107 Fair Use: http://www.copyright.gov/title17/92chap7.html and http://www.copyright.gov/fls/fl102.html . 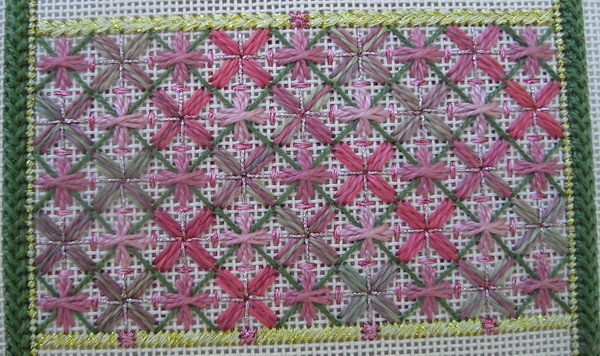 I mentioned that I might want to stitch this piece more than once in the class, and many felt that I could stitch it as many times as I wished from one set of instructions as long as I was not selling them. I pointed out to them, that if this were a painted canvas that would not be the case. As long as you purchased the full pattern from your LNS you may stitch it as many times as you wish using your original set of instructions. 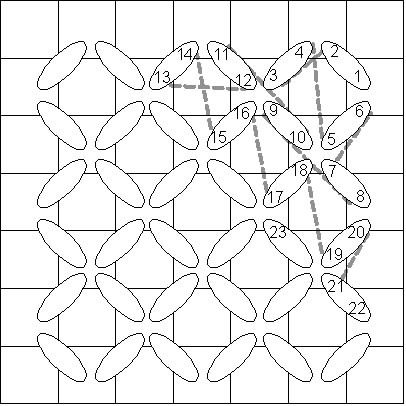 You may not make copies of the pattern or any part hereof and give them or sell them to friends nor may you make the design or any part thereof and sell it — the design is for your use only to make for yourself and/or as gifts. Truthfully I was a bit taken back by the responses. 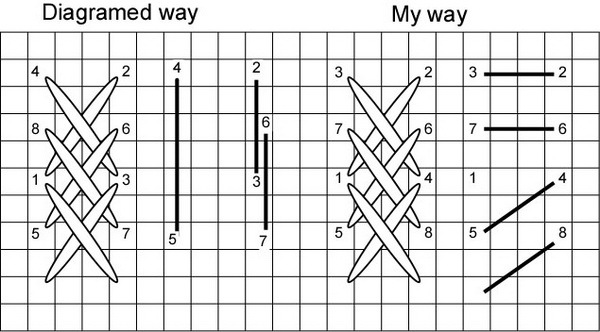 I feel like if I stitch it 2 or 3 times I should do something more than pay for the chart-pack once. If it were a painted canvas, I would have to purchase two or three. I know that some designers of chart-packs are adding a special embellishment that will require you to purchase additional chart-packs if you wish to have the embellishment. AND then there is the question: What do you do if you want a chart-pack or instruction book that is no longer in print (and you know this for a fact)? What if a shop wants to teach such a piece in a class and they have only three copies of the instructions and 6-7 possible students? What if that original designer has either passed away, is no longer teaching, and you have tried every means to get in touch with the designer; can you make copies for a class? I think there are many great designs out there that should be taught again and again…they are classics. I’m not sure where I stand on either issue, but I do know that I think I owe it to the art of needlepoint to do more than buy one chart-pack or instruction book and reproduce it 3 or 4 times. Maybe the answer to both questions is to donate a portion to a local charity or stitching guild of your choice. I am taking a shop project, it is very much like a shop class except the instructor did not design the piece. The instuctor has stitched the piece. It is run very much like a class, we all received a kit with marked canvas, threads, instuctions and needles. Now this in itself is no big deal, I think everyone can and should take a class; you are never too old to learn. You can take a class in needlework or try a new media, whatever floats your boat. I am taking this piece because I think it is just too cute for words. 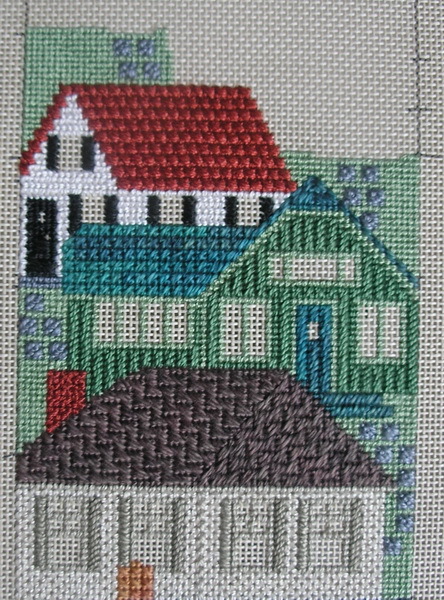 The Neighborhood is from Finger Step Designs by Susan Jones. You can see it at Custom House of Needle Arts, distributors only, (http://www.customhouseofneedlearts.com/index.html ). You must order from your local shop or our local shop carries it: Two the Point (twothepointllc@aol.com) or I also found it at Thistle Needleworks (http://www.thistleneedleworks.com/products/fingerstep/theneighborhood.html ). Remember, if you want to order this, it is only the instructions…my shop is offering it as a shop project and so we paid more to have it set up like a class with canvas, threads and a moderator who stitched the piece previously. I had no one in mind to stitch it for when I decided to take the piece, but now I have thought of at least a couple people I think would like this piece besides me. My husband even said he liked it; it reminds him of growing up in his neighborhood. I really thought this shop project was a no brainer. 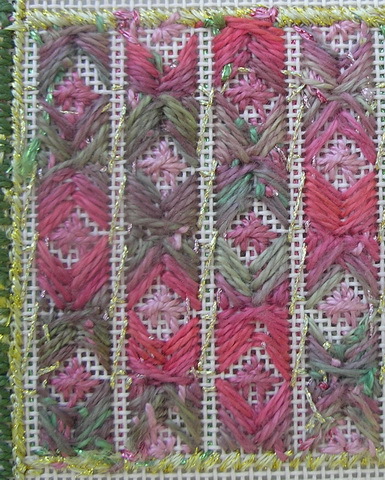 The stitches are fairly simple and straight forward, no layer upon layer, thread upon thread. The threads are all perle cottons, not much laying. There are a couple places you use cotton 2 strands #8 perle, but no big deal… Oh yes, there is the bit about the rayon floss for the window panes but that is the last thing you stitch. Since this is a shop project, my shop marked a canvas and pulled the threads for each of us, just like a class 😉 . What could be difficult about this piece? Well, I’m here to tell you, that if house #1 is any indication this is not a beginning piece! 1st there is COUNTING…Yes, I said counting! Now I am not counting challenged but if the white roof line #1 does not go in correctly the entire house will be off. And you have to think about the order of stitching to make it less difficult on yourself. This is a good reason to be in a shop project/class…someone else has already stitched this piece and knows the tricks, traps and pitfalls. Maryann (shop leader) suggested you start on the left at the mark and stitch top row to the right side and then back. 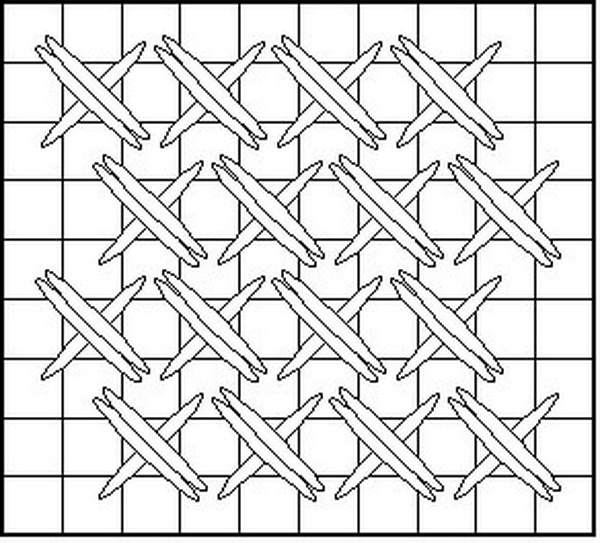 Good thought, if your count is off you only have one row to “frog stitch. ” And even though you as a stitcher should count for yourself twice (remember the carpenters’ rule: Measure twice, cut once)…Stitcher’s rule: Count twice, stitch once! 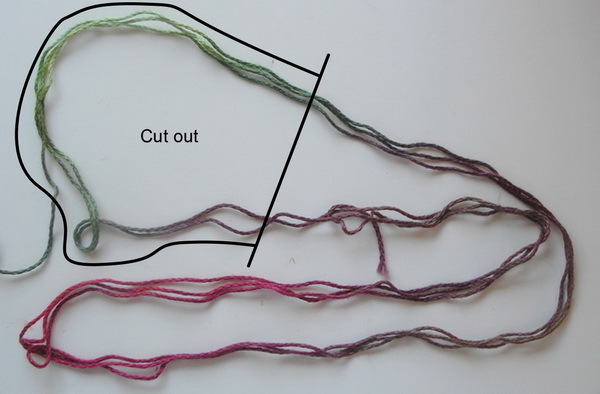 If you count correctly and stitch correctly…this works. 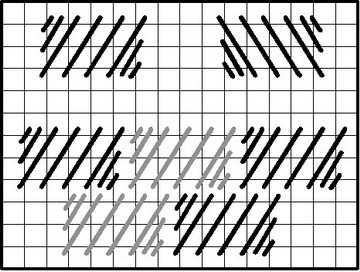 If you are counting challenged, you may be frog stitching. Maryann gave us the stitch counts, but I counted too. The best part is she has lines marked on the side of the canvas that help you check your stitching. #2 is the roof. Pretty straight forward stitch: Diagonal Scotch. Don’t forget to stop at the roof peak, another mark on the side of the canvas. 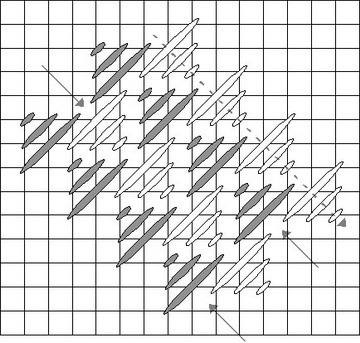 Thank you, since you start at the lower right corner of the area to establish a pattern, I probably would have stitched it right on up to the left side of canvas…too far. This was one of the easier parts to this stitching. #3 Bricks! 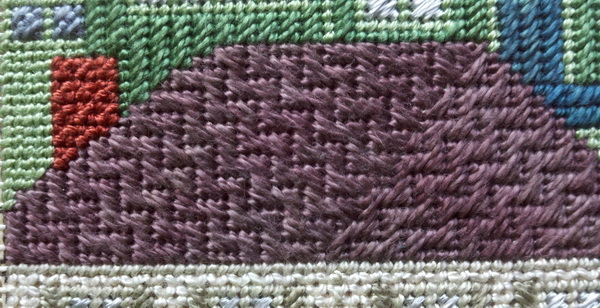 This is an Offset Horizontal Cashmere variation…I say variation because a cashmere stitch is: Stitched from lower left to upper right: over one, over two, over two, over one; this Cashmerevariation is: Stitched from lower right to upper left: over one, over two, over two, over two, over one. You got it…I am already frog stitching! Area 3A is the largest area of full rows in this entire house; there are a couple more areas on the left of the house and below the windows but I’m not there yet. AND then, there is that red line (3B) I have drawn a line on my canvas to help me remember that this is the subtle way to show the corner of the house. The designer, Susan Jones starts and stops the bricks here, very clever, but I would have missed it completely if Maryann had not pointed this out. 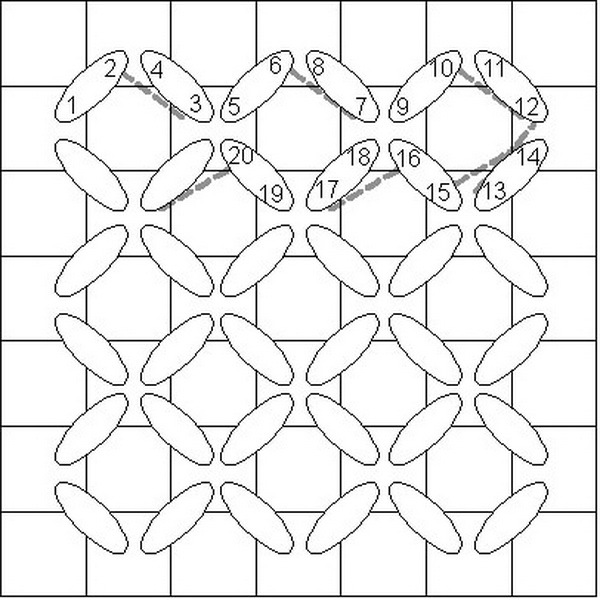 Areas 4 are pretty straight forward…Count to locate a starting point, count for size and placement…Lots of counting. I did okay until I got to the door and then I had a lapse in counting and of course did not notice it until after I had filled in the door. I might not have had this problem if I had stitched the steps and railing first but those I left because somewhere in the recesses of my old mind I remember that when stitching black and white threads, it is best to put the white in first when possible. What can I say: live, frog stitch, re-stitch and learn! Area 5 The Door. Looks pretty easy, but by now I am really checking the instructions and ah-ha I notice that this is not as simple as it looks. Tent frame outlines the door, Mosaic and Cashmere stitches give it the panel look, and the rest is filled with Diagonal Gobelin stitches…BUT every so often there is a stitch over 3 threads just to keep you on your toes.